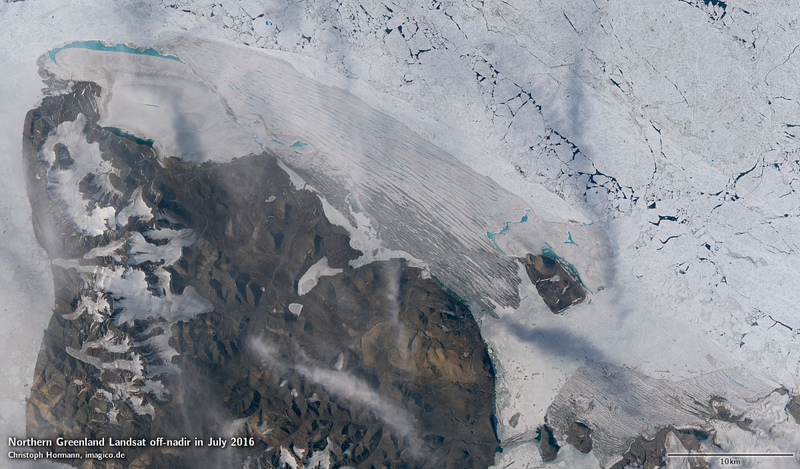 As mentioned previously when writing about images of the Antarctic the USGS announced some time ago they’d be starting to regularly record off-nadir images with Landsat 8 of the polar areas beyond the regular Landsat recording limit. As likewise mentioned these areas are also not covered by Sentinel-2. A few days ago the first set of such images since the early ones from May 2013 i also wrote about previously was recorded in the Arctic in northern Greenland. The path chosen is slightly different from the one from May 2013 which is shown here for comparison. Note both images are in polar stereographic projection so they are not north oriented. Both cover all land areas that are not in the regular Landsat coverage. The new images are not completely free of clouds but fairly clear overall. Mid July is not yet the snow and ice minimum, especially ice of lakes and at the coast is going to melt further in the coming weeks. But the time chosen is a good compromise between snow and ice on the one hand and sun position on the other. And it is possible that further images are going to be recorded in the coming weeks although likely not as many as in the Antarctic half a year ago since this much more interferes with regular image recording on the northern hemisphere because you cannot instantly switch between normal and off-nadir image recording. 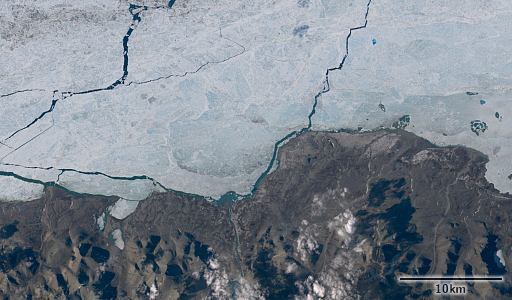 Here a few crops from this new imagery showing the northmost land on earth. 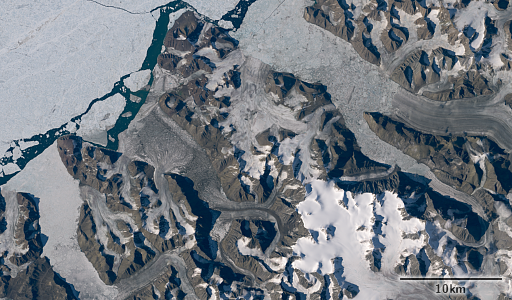 You can also find these on the OSM images for mapping – together with a few ASTER images of northern Ellesmere Island likewise from the past few weeks. Overall with regards to mapping in OSM these areas, which a few years ago were hardly mappable at all, have now a significantly better and more accessible image coverage than many other parts of the planet. Hey Chris, I stumbled onto your blog while learning about how to best use Sentinel 2 satellite imagery, and I just wanted to say thanks for all this information and the work you put out. I also have to ask about the images you pull from the satellite data for your blog posts. They’re always very impressive and seem a lot sharper and more visually pleasing than anything I’m ever able to pull out of Landsat 8 or Sentinel 2 data. Do you do any sort of processing to it before you crop and screen-capture it? The Antarctic imagery you have here is particularly stunning. I’ve searched on your blog to see if you’ve ever addressed this or wrote a tutorial, but couldn’t find anything on it. Any tricks or tips? 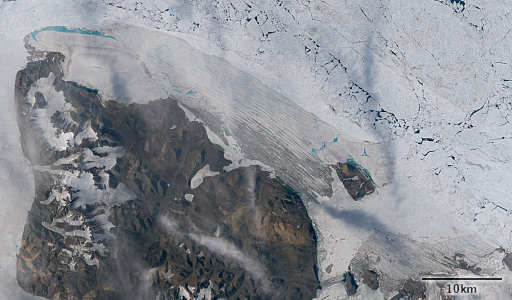 Producing consistent and appealing images from raw satellite data is not a trivial task, there are a lot of considerations involved you cannot teach in a simple tutorial. In principle it is not unlike processing digital photographs so the best advise i can give here is that a background in digital photography with sufficient depth in the physical basics can help. Ah I see. I do in fact have some experience with Adobe Lightroom and the like, but I wasn’t sure if you were getting these results exporting straight from a mapping/image-processing program like Arcmap or ERDAS. So you’re importing these into a photo editing program before posting them here? I will have to try and experiment with that. Thanks for the quick response. When i say background in digital photography i don’t mean experience with particular tools, i mean general knowledge and experience, assessing the potential of subjects and lighting for a good photograph, the physics of light and color, color perception, image sensors etc. Common photo processing tools do not help you there much since they tend to encapsulate the core functionality in opaque features and in fact prevent you from understanding what happens on a basic level. I do most of my image processing with custom tools but this is just a matter of convenience and scalability – in principle you can do most of this also with general purpose image/photo editing programs.